Assassin’s Creed Odyssey, Ubisoft’s latest game, opens with the Battle of Thermopylae. You know, the one that pitted the Spartans of King Leonidas against the Persian troops of King Xerxes. Here, the game succeeds at showing a great number of characters onscreen. I hadn’t seen such crowds since 2014’s Assassin’s Creed Unity, making this truly an epic start to this latest Assassin’s Creed game. Later on, you’ll also get to take part in several big battles which form part of another conflict – the fight between the Spartans and Athenians for control of the ancient Greek world. Ancient Greece sure looks beautiful here – imposing temples with their classical columns, painted statues which look like giant action figures, and plenty of sumptuous scenery which you can travel through either on foot or horseback means there’s plenty of detail to enjoy here. Character models except the protagonists don’t look so great though, and I came across an ugly texture or two during my playthrough. Overall though, ancient Greece looks every bit as gorgeous here as ancient Egypt did in 2017’s Assassin’s Creed Origins, the previous game in the series. This means you’ll have plenty of reasons to want to explore Assassin’s Creed Odyssey’s world, something made even better thanks to the game’s new “exploration mode”. While in earlier Assassin’s Creed games you had your current quest target marked for you on the map, here you can choose to only be given hints of your target’s whereabouts, and have to go exploring on your own. For instance, the game might tell you your quest target (an item or character) might be in the northern part of a certain region of a map, or perhaps west of some landmark or fortress. When you get close enough, the game prompts you to summon Ikaros in order to pinpoint its location. Yes, like in last year’s Assassin’s Creed, you also have a pet eagle here. You can use Ikaros to survey your surroundings from the air, and also locate certain items such as treasure chests when you are raiding enemy locations such as fortresses, for example. 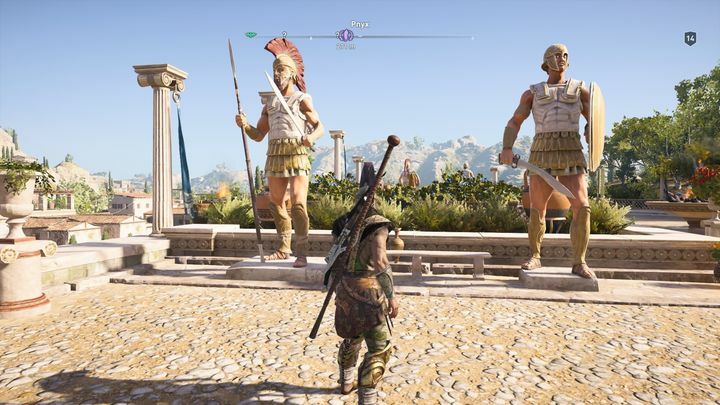 Like its predecessor Assassin’s Creed Origins, Assassin’s Creed Odyssey has many locations such as caves, fortresses and important people’s houses which you can assault. In order to “clear” these locations, you have to kill captains or other high-ranking enemies, as well as loot chests and collect other items. After clearing all the enemies at one fort later in the game, though, I was stuck searching for a remaining treasure chest to loot in order to complete the location. Of course, I had forgotten I could use Ikaros to easily locate the chest from the air. Ancient Greece looks just as pretty as ancient Egypt did in last year’s Assassin’s Creed game. The thing is at that point I had completely forgotten about my winged sidekick, and truth be told, if it wasn’t for the game’s prompts telling me to rely on Ikaros to locate a nearby quest target, I would have hardly relied on my pet eagle during most of my playthrough. This doesn’t mean Ikaros is useless, and when completing one of the many optional locations (in which admittedly I had an obsessive-compulsive desire to collect every trinket and murder every enemy) Ikaros does come in handy, proving to be a valuable ally to either Alexios or Kassandra. Yes, a major, highly publicised change in Odyssey is the fact that you can play as either of two characters here. One of these characters is Alexios and the other Kassandra, who happen to be brother and sister. While previous games like Assassin’s Creed Syndicate let you switch between two characters (and play as a female character too) this is the first major Assassin’s Creed game which you can play the entirety of as a female character, which no doubt will be a plus for some people. 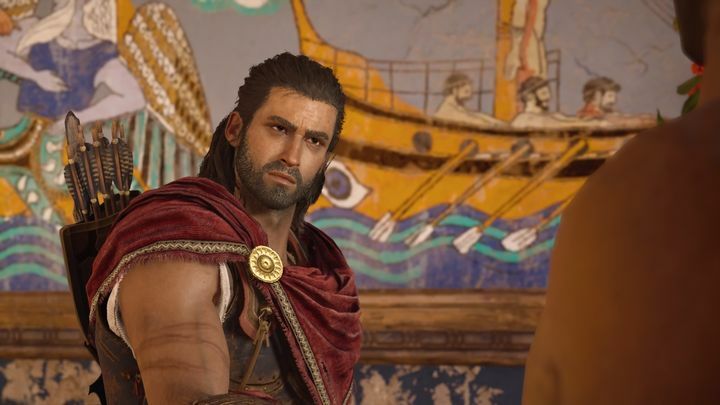 During my playthrough with Alexios, though, I couldn’t help but wonder that while being a pretty good character in the Assassin’s Creed universe, he’s not quite up to par with last year’s Assassin’s Creed protagonist Bayek, or other classic characters like Ezio Auditore, but still a decent enough lead for this game. Another big change in this Assassin’s Creed game and one which makes this game a full-on RPG compared to its predecessors, is the addition of dialogue choices. For the first time in an Assassin’s Creed game you can decide the outcome of certain quests via dialogue, and choose whether to start a fight, lie or engage in romance with someone during conversation. 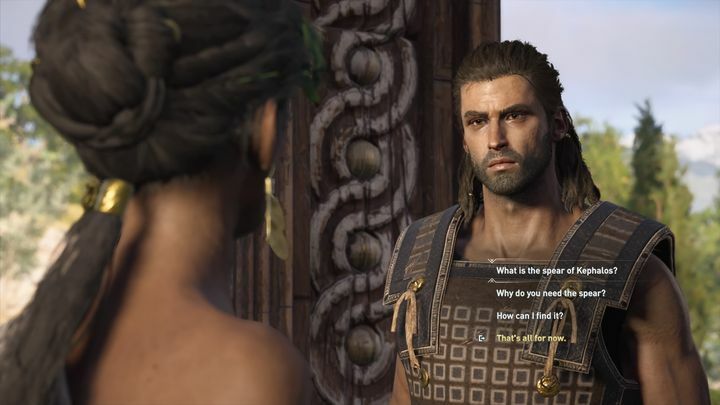 Overall, though, while having dialogue choices seems like a plus, I did not care much for these during my time with Assassin’s Creed Odyssey, even if admittedly I was sometimes impressed with the outcomes my choices had in the game. For instance, during a quest on the game’s starting island of Kephallonia I had to decide whether to let an overzealous warrior priest whose men had burned a village and rounded up its inhabitants for execution kill the last few survivors or not. You see, the man was convinced these people were afflicted with a deadly disease which might spread on the island unless they were executed. I chose to kill the priest and his men, only to discover later on that the people he wanted put to the sword were indeed afflicted with a deadly disease which had spread on Kephallonia. Dialogue choices are a new feature in Odyssey, but their addition isn’t as game-changing as you might expect. It’s a few occasions like these which made my choices in dialogue worthwhile, even though I could have enjoyed the game almost as much without me getting to pick a dialogue response every now and then in conversation (something which can break the flow of dialogue), and the truth is sometimes these dialogue choices only exist so you can get additional information about a quest you’re about to embark on anyway. Aside from the dialogue choices, and as befits any RPG, there’s a ton of gear for you to play with during your adventures in ancient Greece. Some of these is available from vendors all over Greece, but I found myself getting most of my gear from fallen enemies, mercenaries and members of an evil cult I had to deal with during the game. This doesn’t mean visiting merchants is pointless here, as you can upgrade your weapons and armour at blacksmiths throughout the game world. This means that you can keep your favourite weapons and armour up to date and keep using them throughout the game, instead of having to sell them after picking up better items during quests, something which is a nice addition to the series. But the fact I could upgrade my favourite weapons and armour also made me realize that this is a game in which you’ll end up collecting an insane amount of gear, and having to go to merchants regularly in order to sell all those obsolete swords I had picked up during my adventures in order to prevent them from clogging up my inventory got tedious at times, truth be told. 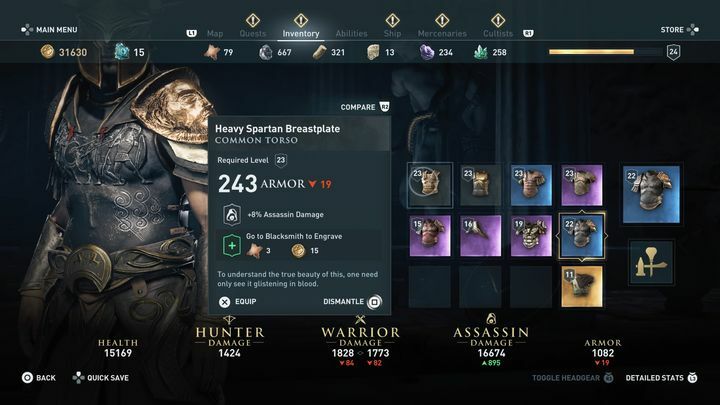 But still, the abundance of gear sure is impressive, and those with a desire to equip their character with the best stuff they can find will be delighted while playing Odyssey. Plus, there’s also the Spear of Leonidas, a fearsome weapon you acquire early in the game which is a joy to use throughout and is also tied to the game’s special abilities. Like any RPG worth its salt, you get points to upgrade your special abilities as well. Every time you level up, you acquire devastating abilities to use during combat, such as one which allows you to dispossess an enemy of his shield during a fight and another which lets you replenish your health during combat, two of my favourites in this game. There’s a ton of weapons and armour to play with in this Assassin’s Creed game. You can spend more points to improve the effectiveness of certain special abilities, although improving an ability beyond a certain level might require that you upgrade the Spear of Leonidas first, something you can do at various points in the game once you meet the necessary requirements. Using special abilities during combat sure is fun, while the combat itself is balanced and entertaining, if a little too easy at the default difficulty. Increasing the difficulty to hard yields a healthier challenge, though. You can also lock onto enemies during the game’s battles. 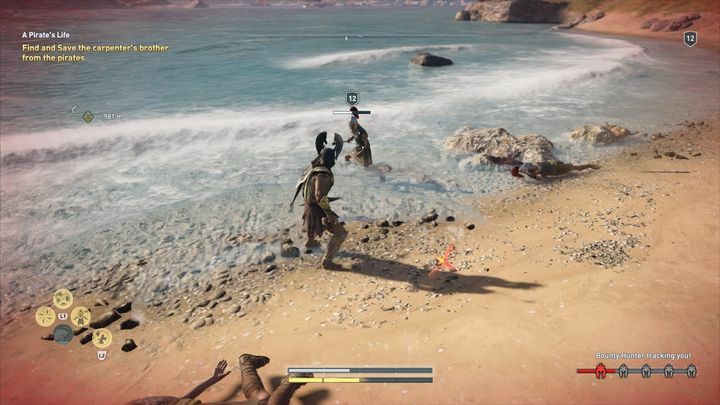 This is OK when you’re fighting enemies one on one (such as one of the mercenaries who are after Alexios’ or Kassandra’s hide in the game), but not so effective when you’re dealing with a bunch of enemies at once. This is because switching targets during a battle feels a bit clumsy when you’re locked onto an enemy, while this is also something of a hindrance if your enemies start getting the better of you and you need to run away from battle all of a sudden. And as you might expect, there are plenty of deadly enemies to contend with during the game. Aside from the epic battles in which you take the side of the Spartans or Athenians and have to fight the other side’s soldiers to the death, your character will also be hunted by mercenaries throughout the game. These all have their own unique names, appearance and story (which you can read in one of the menu screens), making each encounter more intimate and personal. The way mercenaries are presented in the game also reminded me of the orc enemies in Middle-earth: Shadow of Mordor, although there’s nothing as complex as that game’s Nemesis system at play here. Of course, while being pursued by even higher-level mercenaries throughout the game adds a level of tension to the proceedings (and those battles with mercenaries sure are epic), they are small potatoes compared to the members of the cult you have to take out throughout the game. The cultists have important positions in Greek society, and much like the Templars seen in previous Assassin’s Creed games, have a desire for control and power. You get to hunt these bastards throughout the Greek islands, and some of these encounters can be pretty tough as you work your way to Deimos, the cult’s top soldier and murder weapon. Revealing who this character is would spoil one of the game’s best surprises, but suffice to say you’ll have plenty of reasons to want to get even with this character as you work your way to the end. Combat is an exciting part of Assassin’s Creed Odyssey. Regarding Assassin’s Creed Odyssey’s characters and story overall, I found this to be a step up from its predecessor Assassin’s Creed Origins, thanks to some memorable characters such as Alexios’ mentor Markos and a feisty girl named Phoibe. There’s also Athenian philosopher Socrates (who’s appropriately philosophical in his speech) and the Spartan general Nikolaos, who are also interesting. But while Origins might have a better-realised protagonist and admittedly more nuanced storytelling, I found myself more emotionally involved playing Assassin’s Creed Odyssey. Actually, I found the death of one of the game’s key characters at one point in the story moving, something I had not experienced when playing a video game to date. Other aspects of the game are just as satisfying, such as climbing viewpoints and synchronizing these, even if doing so is less essential now given that the game relies more on exploration than earlier Assassin’s Creeds. This is still a good idea though, as synchronizing viewpoints improves the perception of your eagle Ikaros, making it easier to locate quest objectives and other items from the air. As in previous games, viewpoints are marked by an eagle icon on the map, and some are magnificent structures worth climbing in order to enjoy the view from the top. Some of these are ordinary structures such as abandoned houses which are not so great to climb such as the huge statue of Zeus you scale early on in the game, though. Nonetheless, climbing and synchronizing viewpoints is still one of my favourite activities in this game. Also, while I spent most of my time on land, the game features more of the naval combat that made earlier games in the series such as Black Flag so much fun to play. Sailing the seas here is rewarding, even though I found the things I had to do on land quite a bit more interesting in this Assassin’s Creed game. Assassin’s Creed Odyssey is more substantial than earlier entries too – there’s enough content here to take your playthrough time to the triple digits if you’re willing to explore every nook and cranny and take on every single quest. The modern day segments are something of an afterthought as in last year’s Assassin’s Creed Origins though, and the truth is that the immense majority of your time will be spent in ancient Greece here rather than in the present. I still enjoyed these interludes, even if I am still longing for the more throughout modern day experience found in earlier Assassin’s Creed games. Nonetheless, when all is said and done, it’s clear Assassin’s Creed Odyssey is another impressive entry in the series, and a worthy follow-up to last year’s game which sure leaves me wanting to see where the series is headed next.